This formula is potent with ginger, frankincense, and rosemary to stimulate energy, calm nervous exhaustion, sharpen the senses, improve memory, aid in recall, and relieve nausea and hangovers. Ginger 100% pure essential oil stimulates energy and calms nervous exhaustion while warming the heart and opening up feelings, helping to improve communication. Ginger oil also helps with hangovers and nausea. With rosemary combined, its aphrodisiac qualities may help cases of impotence. Frankincense 100% pure essential oil revitalizes the body and mind when a person is mentally or physically exhausted. It is also stabilizing, centering, and helps to focus energy. Rosemary 100% pure essential oil enhances mental clarity while aiding alertness and concentration because it stimulates and strengthens the central nervous system. Rosemary also lifts spirits, counters depression, balances intense emotions, and controls mood swings. Suggested Use: This blend may used daily using any of the following methods. Place a drop under nose or into specific points (i.e. acupressure points, trigger points, etc.) for additional therapeutic effects. Use in an aroma diffuser (just a few drops in water) for therapeutic inhalation effects. Add a few drops to a bath, vaporizer, compresses, etc. or add additional base oil for massage. Essential oils are also great for enhancing any mindful practice including: meditation, yoga, Qigong. 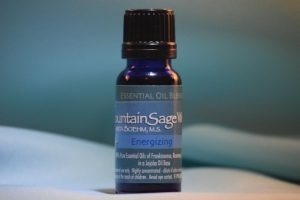 Therapeutic effects of essential oils are vast and vary for each oil (i.e. emotional balancing, muscular, circulatory, respiratory, etc.). Do not use if pregnant. If skin irritation occurs, add more base oil (i.e. jojoba oil, etc.) or discontinue use. Avoid eye contact, swallowing, and contact to open wounds.